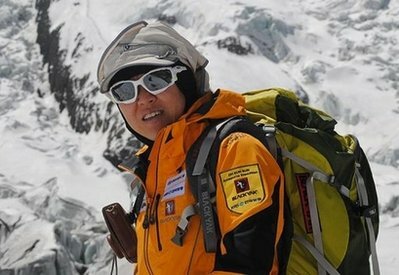 South Korean climber Oh Eun-sun claimed the record as the first woman to summit all 14 of the world& #39;s peaks over 8,000 meters when she scaled Mount Annapurna in Nepal on Tuesday. Oh, 44, reached the Annapurna summit, the world& #39;s 10th highest at 8,091 meter (26,545 feet), at 0918 GMT with three sherpa climbers and two members of Korea& #39;s KBS Television, said Song Hea-kyoung, an official of the Korean Trek and Expedition, which provided the logistics for her record attempt. "With this she has climbed all 14 highest peaks," Song said of Oh. Nineteen men have climbed all 14 peaks above 8,000 meters (26,246 feet) so far. Italy& #39;s Reinhold Messner was the first man to achieve the feat. Oh was beaten back on Annapurna, considered one of the world& #39;s most treacherous mountains, in autumn last year by bad weather. She narrowly beat Edurne Pasaban to the record, after the Spaniard climbed Annapurna earlier this month. Pasaban is in Tibet where she has been preparing for her 14th and final climb, an assault on Mount Shisha Pangma. There was no immediate comment from the Nepali government about Oh& #39;s record, and it was unclear if her place would be recognized by climbing historians. Climbing historian Elizabeth Hawley said Oh& #39;s 2009 ascent of the world& #39;s third highest Mount Kanchenjunga was in dispute as the picture of the climber was "clearly" not at the summit of the mountain because it showed her feet on the rock and not on snow.